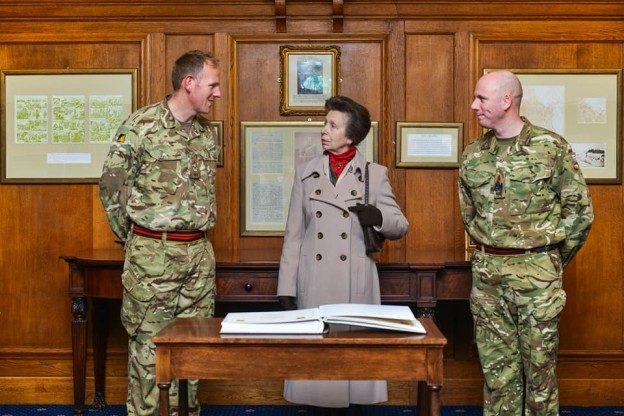 HRH The Princess Royal, Colonel in Chief of the RLC, has paid a Royal visit to Buckley Barracks, the HQ of 9 Regiment RLC. Her visit took place in company with the Lord Lieutenant of Wiltshire, Brigadier Murray, the Corps Adjutant and the Corps Sergeant Major. The visitors were greeted by the CO and RSM at the Officers’ and Sergeants’ Mess and were given the opportunity to meet a range of soldiers and officers, including those who have been on recent overseas deployments and those who have been great sporting ambassadors for the Regt. HRH also presented Operational service medals to Capt Butterworth, Maj Player and Maj Gardner and met some of the families of soldiers and officers serving with the Regt.